It was 1994, and my buddy and I were looking for games we could play together. At the time, that meant DOS games running on a PC. Neither of us particularly enjoyed playing against each other, so we were trying to find games that could be played cooperatively. We invented cooperative modes of play in turn-based strategy games like Panzer General and Warlords II. We hot-seated single-player games like Duke Nukem. But that killer cooperative game remained elusive. When we discovered that EA's NHL '94 could be played cooperatively, it was a revelation, and began a never-ending quest to find more great cooperative games. Many single-computer sports games are uniquely positioned to provide a multiplayer experience, since there's typically only one view (an arena or stadium, or the portion of it where the action is currently taking place), and all players are almost always visible. All that's required is support for multiple controllers, and an understanding on the part of the developers - that cooperative play is worthwhile. 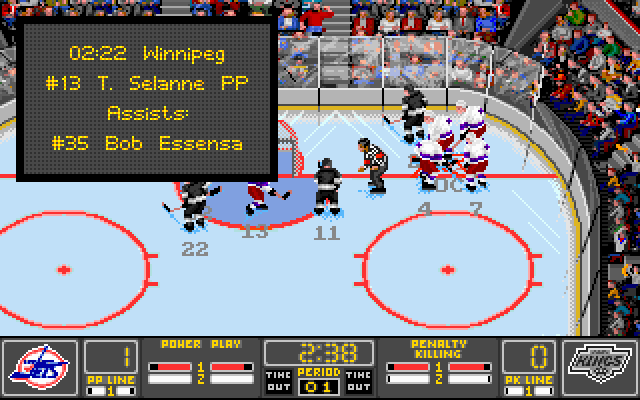 EA's NHL '94 was a lot of fun to play cooperatively. We quickly learned how to work together: one player digging the puck out of the corner while the other fought to stay in scoring position in front of the net, waiting for that perfect pass. Sure, the graphics were crude, and the audio limited, but the overall experience was a blast. EA also understood the value of having real NHL players in the game, and licensed the use of their names. Roster updates were provided by EA for free. Epic, weekly sessions ensued. We also discovered that we could play cooperatively with as many as four people, and eventually started doing that as often as possible, although it could sometimes get a bit crazy. Still, four people around a single computer, bashing away on their controllers, with excited yells as we scored, high-fives all around, are some of my fondest gaming memories. The EA NHL game changed over the years: the visuals and audio improved with available technology. Platforms were added, and we shifted from DOS to Windows, then eventually to consoles. We switched from joysticks to gamepads, then to console controllers. Features were added and removed, sometimes seemingly at random; some of the best features appeared appeared only once, such as individual user stats. Indeed, we started to notice early on that EA seemed to be starting from scratch each year, with the result always having better graphics, but with various aspects of gameplay either improving or actually getting worse. It became a running joke to wonder whether each year's game would actually be an improvement over the previous year. One year, the EA game was so terrible that we played the 2K NHL game instead. Along the way, LAN and Internet gaming became possible as well. Until recently, we never found it necessary to use any of the network-based multiplayer modes, because we were always able to get together in the same place and play on one computer or console. Now, sadly, that's changed. We live in different cities, and our living situations (and health) aren't necessarily conducive to loud, beer-fueled, all-night hockey sessions. Okay, so what about online gaming? Sure, it's not going to be quite as much fun as being in the same room; virtual high-fives just aren't the same. But at least we'd still be able to play, right? Not so fast. There are several major hurdles to getting two or more people connected to play online. First, they all need their own computer or console, and they have to be the SAME KIND of computer or console. For PC gaming, that means a graphics card, which adds several hundred dollars to the price of a PC. Each PC would need to be able to run the most recent game, so the CPU and RAM specs needed to be current. Of course, consoles get around that problem, as long as everyone has the same make and model. Still, the expense involved in everyone having up to date hardware made this difficult. But there are more hurdles to playing online. Everyone would also need to buy their own copy of the game. Since we always wanted to play the most recent edition, that meant everyone would have to shell out $60+ every year. For many of us, this was just too expensive to consider. Keep in mind that this was never an issue when we were huddled around a single computer or console; only one copy was required. And so our epic hockey sessions gradually reduced in frequency, then stopped happening completely. Sad faces all around. But that's not the end of the story. A few weeks ago, while commiserating with one of my hockey buddies, he proposed a solution: he would buy an XBox 360 (the same console I currently own), and we would both purchase the most recent EA NHL game we could find that still runs on the 360. We quickly determined that our best bet was EA Sports NHL Legacy Edition, which was released in 2015. And it works. We're able to play cooperatively online. But there are some serious limitations. YES, there are good reasons for these limitations, but they only apply to competitive, human vs. human games where the players aren't actually friends. No way to pause the game. Have to pee? Hold it until the end of the game! Need to get another beer? Sorry, you have to wait. Girlfriend called? Send her to voicemail. Pizza arrived? Let it get cold. Weirdly, there isn't even a way to call a timeout. No way to change controller settings during a game. Using the wrong scheme? Too bad; suffer with it or cancel the game and start over. No way to choose player colour. Used to being blue? Sorry, you're stuck being the almost-invisible yellow. No way to remove yourself from a game, or join one in progress. Replays are automatic and un-skippable. There's no way to stop play and manually check a replay to see what just happened. Most gameplay settings are simply unavailable. In the local multiplayer game, you can tweak gameplay in numerous ways, to make the game more fun. In the past, we adjusted these settings frequently, gradually ramping up the difficulty as we got better. Being able to adjust game speed, pass speed, pass accuracy, pass interceptions, and automatic shot aim all made the game a lot more enjoyable, especially when a particular edition had gameplay bugs. Playing Legacy online, there's a single difficulty setting and that's about it, and even that is limited to GM mode. Here's a suggestion for EA: add a 'couch experience' option for multiplayer modes. Show a big red warning message if you must, but please let us experience the game without all these restrictions. Open leagues and games would never use this option, because doing so would be untenable when the participants don't even know each other: the result would be both unfair and awkward. But for those of us who are used to playing cooperatively with good friends, it would be wonderful. There's a complete analysis of the XBox 360 disc scratching problem elsewhere on this site. The XBox 360 Kinect hardware now lets you control your XBox by talking to it. That's all well and good, and apparently it works reasonably well, but the vast majority of owners (including me) use our XBoxes almost exclusively to play games. On the other hand, people who have hacked their XBoxes, allowing them to run games directly off the hard drive - without requiring the disc - may find this very useful. So, is Kinect voice control the best reason yet to hack your Xbox 360? The XBox 360 has a feature that lets you 'install' a game to the hard drive. My immediate reaction upon learning of this feature was no doubt the same as everyone else's: "Awesome! Now I won't have to keep swapping discs whenever I want to play a different game!" If only. My first XBox 360 - the one I just recently resurrected from the Red Ring of Death - died again. After several weeks of use, the graphics and sound started getting corrupted after a few minutes of play, then finally just gave me the RRoD on startup. But I brought it back to life once more! Now that I have a workbench again, I'm getting back into old projects. My first XBox 360 died with the classic Red Ring of Death some time ago and has been sitting in a storage locker in the form of a pile of parts since then. When it died, I had already voided the warranty some months earlier by opening the unit to install padding under the lid of the DVD drive - to stop it from scratching discs. That repair had been a complete success, but then the RRoD happened. I would have been able to send the unit back to Microsoft for warranty repair if I hadn't opened it because they extended the warranty to three years specifically for RRoD issues. Sigh. I bought my second XBox 360 after my first died of the horrible 'Red Ring of Death.' I had successfully modified that 360 a few months earlier, installing padding (under the lid of the DVD drive) that prevented the drive from scratching my game discs. Unfortunately, opening the 360 had also eliminated the possibility of returning it for repair/replace as part of the extended 3 year coverage specific to RRoD issues. Oh well. That 360 is now a pile of parts in a box. I tried one of the X-clamp fixes on it with no success and plan to keep trying at some point, but meanwhile I bit the bullet and bought another 360.